Published: Dec. 28, 2015 at 02:56 p.m. Updated: Dec. 29, 2015 at 03:23 p.m. The NFC playoff teams are set. Now we just need to figure out where the teams will be seeded. Week 17 will have less drama than usual in the NFC because the Panthers, Cardinals, Packers, Redskins, Vikings and Seahawks have already punched their playoff tickets. But seeding makes a big difference, and nearly every seed remains up for grabs. There's one exception to that ... let's get into it. 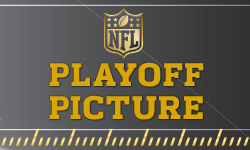 This is our final look at the NFC's playoff picture, which can be seen in full here. Led by Kirk Cousins, the NFC East champions are playing their best football late in the year. At 8-7, the Redskins could still be one of the worst teams in NFL history with the option to rest their starters in Week 17. Sunday's game against Dallas means nothing for Washington other than the bragging rights of a winning record. The Redskins' backup and No. 3 quarterback are both much better than Cowboys starter Kellen Moore, anyhow. The Redskins can't improve their seed, so they will be hosting a Wild Card Weekend game. And there is a big difference between facing Seattle (yet again) and the NFC North runner up. Could Packers and Vikings win by losing? The Green Bay Packers and Minnesota Vikings play for the NFC North title on Sunday night, with the winner getting a home game against the NFC's No. 6 seed. The only problem with that scenario: The Seahawks are currently the No. 6 seed. Would you rather have a road game in Washington or a home game against the Seahawks? While the chances for a win look better against the Redskins, it's not like NFL teams would ever think that way. The Packers and the Vikings are both trying to play quality football heading into the playoffs. Minnesota is succeeding lately; Green Bay is not. The NFC North crown also has meaning, especially to the Vikings. It's even more important to ownership, financially, to add a home playoff date that brings in huge added revenue. The Packers and Vikings will know their potential opponents before they suit up. If the Packers lose to Minnesota, they will be the No. 5 seed and head to Washington regardless. Things are more complicated for the Vikings. If Seattle wins in Arizona on Sunday afternoon, the Vikings could fall to the No. 6 seed with a loss on Sunday night. That could mean trips to Lambeau in back-to-back weeks for Minnesota. So much for the Panthers resting starters. Carolina's loss in Atlanta combined with the Cardinals' utter destruction of all things Green Bay guaranteed a more interesting Week 17 in the NFC. The NFL cooperated by moving Carolina's finale against Tampa to 4:25 p.m. ET so that it started at the same time as Arizona. The scenario here is simple. The Panthers clinch the No. 1 seed and homefield advantage with a victory over the Bucs. If Carolina slips up again, Arizona could win home-field advantage by beating the Seahawks. The Arizona-Seattle game is a strange one. These are two of the best teams in the entire league and division rivals. Coming off a bad loss at home, the Seahawks don't want to go 2-4 in the division. But this game might ultimately mean nothing. The Cardinals and Seahawks could be locked into the No. 2 and No. 6 seeds based on results out of their control. If nothing else, the Week 16 results guaranteed that Carolina and Arizona would be going all out this week. "I don't think you get anything out of resting guys," Cardinals coach Bruce Arians said. "We're playing so well right now, we don't want to change."